Although fall hasn’t arrived yet and we’re still experiencing very warm days, I’m excited to wear and start talking about fall transition pieces. I wore this hi-low crochet back sweater yesterday and it’s the perfect mix of fall-like, yet lightweight enough to wear now. While it’s still warm, I could wear this sweater with a black pair of shorts and sandals. When it gets cooler, I can pair it with jeans and boots. Yesterday I knew I would be inside a building that’s often quite cold, so I paired it with these jeans and leopard print flats. Add in some beautiful fall accessories and I have the perfect transition outfit. I purchased this sweater on clearance from White Plum and unfortunately it’s currently sold out. I love the hi-low style, plus the crochet detailing on the back of the sweater is just gorgeous. On top of the love of the style and detailing, this sweater is incredibly comfortable. Would you like more outfit ideas for moms? Check out Real Mom Style, which is hosted today by Ellen over at Thrifty and Chic Mom. Previous articleOld Navy Women’s Jeans $19, Plus Get $5 for Trying a Pair On! I like it, I’ve seen these sweaters around a lot. 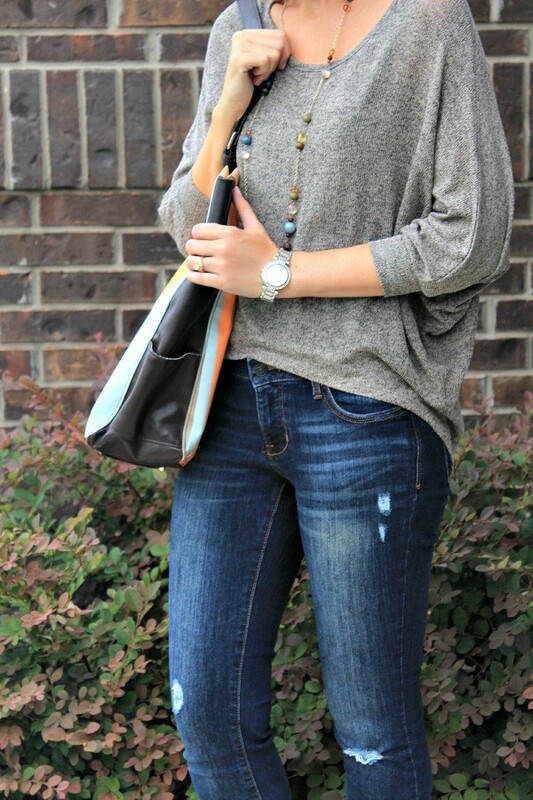 I love pieces that can be worn at the end of the warmers days right into fall. Love it with the jeans and definitely can see it with the shorts and sandals too! I love the hi/low trend! I definitely prefer a sweatshirt or sweater with that cut, and I wore hi/low tanks all summer! I find them very flattering. I really like this one! It’s just casual enough for every day, but the crochet detail dresses it up a little. Cute! Ooo I love this sweater the back detail is so fun! Great outfit. LOVE IT! Need it too. You look great!